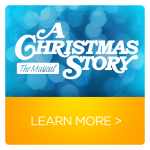 Set in the 1940s, this musical version of the holiday classic film follows 9-year-old Ralphie Parker and his quest for the Holy Grail of Christmas gifts: an Official Red Ryder carbine-action 200-shot Range Model air rifle. Ralphie plots numerous schemes to achieve his desperate desire for the coveted BB gun. All the iconic scenes from the movie are here, and the delightfully versatile score ranges from gentle ballads to show-stopping numbers.